Nice script and its very usefull, Moreover steps are very clear to understand everyone and enjoy the technologies. Its a very useful tool which can be implemented in any Citrix farm . This helps Citrix administrators to be proactive in resolving issues. Simple and less effort. Thanks for the good work and chat support provided for making this script to work. Possible to include the Profile Management Service? Dude… I was glad to see the script. . Which is neatly explained and segregated into functions. I scheduled this script after some tuning in my environment for every day. It is taking around 30 min to complete the report and send. Its been over a week and I am still thinking what is missing in this report :D.
Great work and wonderful job Gins. Proud of you boy. 1. Not able get the image in the report. 2. Sometimes, different zone servers are reported as not ping able. No consistency in that. Not the same servers. When I ran report from server in 1 zone and issue is faced for other zones … not sure of it. I will work towards your cons and need your help. I was not active some time and will try to be active. We will discuss and will help you offline. Can you please add the provisioning service options? For the rest a great script! First of all, thanks a ton for this wonderful script and I’ve deployed this for multiple customers. However, I have something that I’m unable to sort it out. 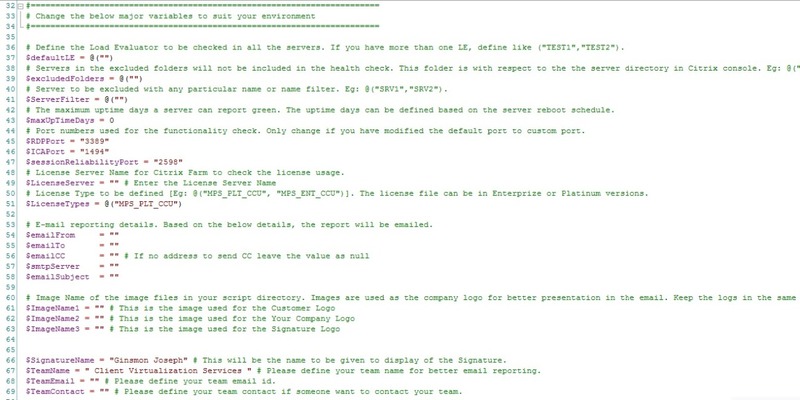 Everything on the report mail comes fine for all customers only the License part always shows “Citrix License Usage: Error; Check Detailed Logs”. So, need your help here to resolve this issue. Hi Ginsmon, Thanks a lot for this wonderful script. Have you found the fix to License issue ? We also getting the same. I found the cause for the same. Working towards the fix. I could not focus last few months due to my personal reasons. I will try to make my blog active sooner. 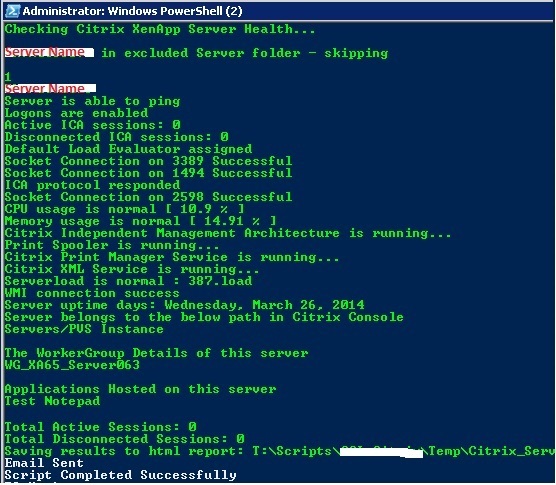 Does this script work on Citrix Presentation Server 4.5? Why AvgCPU got error randomly ? Just wanted to say Great job on this script and keep up the good work. I hope to see something similar in the future that would check the health of the entire citrix stack…7.6 XA/XD, PVS, NS, and even XenMobile. That would be something I would gladly pay for. I accept the challenge. Hopefully i can do it. Do you have test environment to test my scripts? My company is a citrix platinum partner and we have expert engineers in nearly anything citrix or related. We do have a test environment and I can guarantee many of our engineers would be happy to help you test. Hit me up offline and we can discuss. I am starting my long vacation. I will be back to my blog actively from mid of Jan and looking forward working with you. Not a problem. Grab my email address from my account info and we can setup a time to chat over the phone/email and discuss this when you get back. How do I download this script. I am unable to download it. You are Rock Star !! this was with me but not as consolidated as you presented here. Thank you so much and all the fame and accolade I will get by using this is truly yours !! Hi Gins…I know u dnt need more comments of appreation from my end for this awsome work… coz U already had enough!!! 😉 … good to know that its moving arround well and gettting more features added to it as a result in parallel… keep us posted on your updates on the same and will defenitly reach you out offline…all the very best my dear mate…great go!!! I am sure ur dedication will defenitly keep this blog active… All the very best dear mate…Great goo..!!! Hi Dear…I know you don’t actually need a comment of appreciation from my end on this wonderfull job…coz u had enough already…lol!!! Its gud to see it goes well arround n thus getting updates added to it in result…I may need your help on this stuff specifically on some topics n will reach u offline…keep up the gud work as always mate…you have my best wishes….gr8 goo…!!! Also let me know what is the requirement for 4.5 farms. This would be very interesting for me, too! What is to be done to make it work with a 4.5 farm? Thanks a lot for this wonderful script. 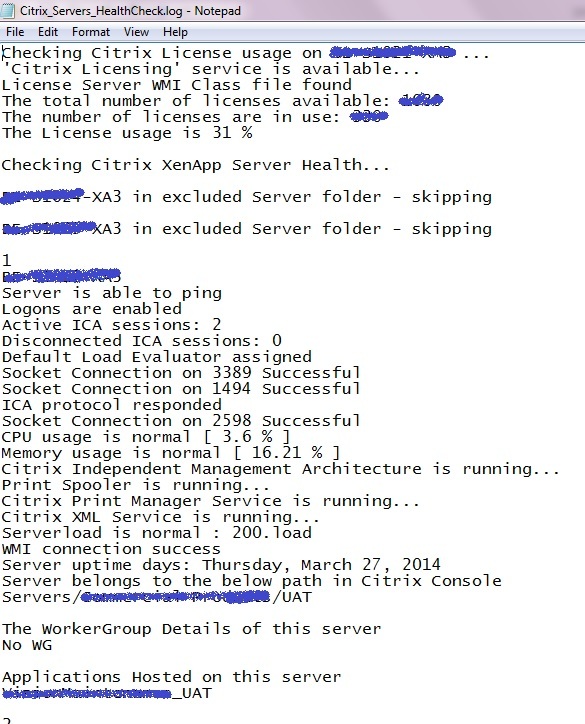 i need your help and guidance to develop monitoring for Citrix XenApp 6.5 & 7.6. Please let me know the email address to reach you for further discussion. you can reach me at ginsmon@live.com. This script will work for XA 6.5. Script for 7.6 is in testing phase. As of now, the script is not intelligent to perform the same. However a new version of script which can read server names from text file for Health Check is in progress. That should help you to test only few servers with a manual input of the server names. Any suggestion, to rerun a script for failed servers…. instead of running the entire script post remediation. There is a script being tested to read server names from the text file and you can define the number of servers to be checked. The complete HTML reporting code needs to be changed to write into an excel. But a lots of code change is required and it is possible. Hi Joseph, first of all thank you for this script. It’s really appreciated the effort you have put into this. That being said, is there a possibility to have the available disk space show up in the table?